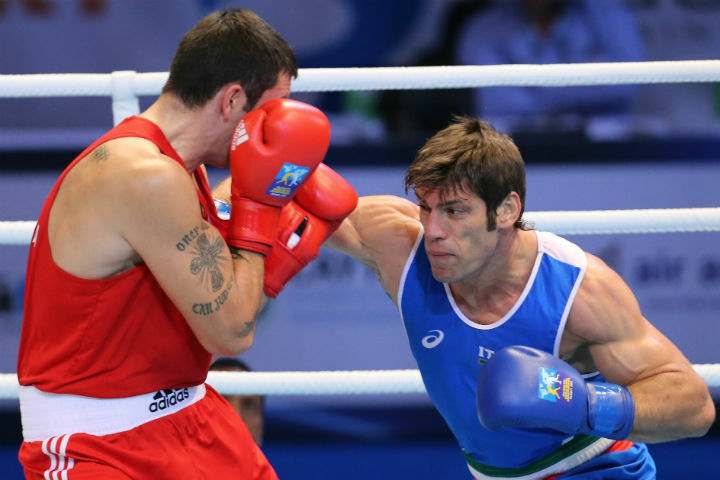 APB and WSB star Clemente Russo of Italy looked in good form today as he moved through to the semi-finals of the AIBA World Boxing Championships Almaty 2013. Since today was the start of the quarter-finals, not only was the standard of boxing fantastic, but we also had five different weight categories take to the ring for the first time this afternoon session. These were namely, the Light Flyweights (49kg), the Bantamweights (56kg) the Light Welterweights (64kg), the Middleweights (75kg) and the Heavyweights (91kg). Everton Lopes of Brazil was impressive again at Light Welterweight against Evaldas Petrauskas of Lithuania. The Brazilian World Champion was taking on the Lithuanian hammer, whose right hand was developing something of a reputation around here coming into this bout. The variety of Lopes' techniques and his range of movement however caused Petrauskas problems throughout the first and the second rounds. He found it hard to close the gap on his taller and more mobile Brazilian opponent. Like in his last outing, the Brazilian seemed to relax more in the final round and boxed with his hands down a lot of the time. If you stop to think about it, doing this with an opponent with one punch knockout potential, is either an indication of extreme confidence in your ability, or.something else. Nonetheless it was Lopes who advanced following a split decision. "It was a difficult fight", said the Brazilian. "He is an Olympic level opponent so I am pleased I got the win. My tactics were to push him as hard as I could physically, and to hit him as hard as possible". Heavyweight Clemente Russo took to the ring again against Marko Calic of Croatia. The APB boxer looked far more focused than he has in the previous rounds of the competition, and showed serious respect to his opponent. The Croatian had the reach and height advantage and used it to work his jab, while Russo worked the body with his left, and looked for chances to throw the overhand right. Clemente looked the busier of the two throughout round one and two, and began to drop his hands as the bout wore on and his confidence picked up. He got clipped once or twice for this in the third, but he remained happy enough with the strategy to persist with it. He took a comfortable looking win (3:0), though it would be surprising if we get to use that phrase again in this Championships any time soon. "This was a tough fight", said the Italian, who also boxes for the Dolce & Gabbana Italia Thunder WSB Franchise. "My opponent today was very good, very fast. But what I have on my side is the experience, I'm 31 now. So things have been ok so far, but the tournament really starts on Friday". Heavyweight Yamil Peralta of the Argentina Condors took on young Irish boxer Thomas McCarthy in the last bout of the session. The Irishman landed a big overhand right at the end of the first in what was possibly the most important phase of the round. From round two, the WSB boxer's experience began to show against the Irish debutant. It was a solid performance by Peralta, who hasn't received much coverage so far on his way to the semi-finals, but who has been very consistent nonetheless. But the future looks bright for Ireland with Peralta admitting: "He was strong so I tried to stay away from him and not let him hit me". Elsewhere, an overjoyed Mohamed Flissi of the Algeria Desert Hawks guaranteed his country a medal by defeating Brazil's Patrick Lourenco at Light Flyweight. The Algerian has been great throughout this tournament and looked good enough today to take the split decision, much to the delight of the singing Algerian fans, who would have won most musical supporters of the session, were that a category. Jason Quigley of Ireland seemed to go up a gear today when he out-boxed Zoltan Harcsa of Hungary. Looking extremely fast on his feet for a Middleweight, the Irishman really came alive today. "I was very happy with my performance, I really upped my game today". Journalist: "What do you have to do now to prepare for your next bout?" Yamil Peralta (Argentina): "Well, the first thing I have to do is. have a siesta".